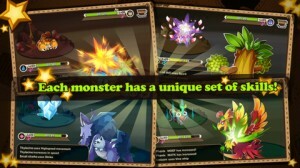 Haypi Monster is an iPhone game developed by Haypi Co Ltd. A monster collecting/ranching game, Haypi Monster lets players collect hundreds of unique monsters. 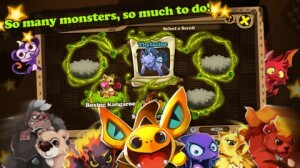 Once collected, new monsters can be obtained through evolution, breeding, and synthesis. Regular readers may recognize the Haypi name. 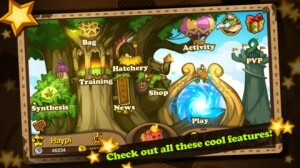 Previously, we reviewed their Haypi Dragon mobile title, which consists of dragon training blended with MMO elements. In our review, we noted that “the interface is pretty cluttered…[and] that clutter may impact the enjoyment you’ll get from Haypi Dragon.” So, how does Haypi Monster stack up to Haypi Dragon? While the interface seems a bit cluttered on an iPhone screen, the overall design of Haypi Monster is vastly superior to Haypi Dragon. The character designs are also much more unique and creative. If you’ve every played Pokemon or one of the many games it inspired, then the core gameplay itself will be instantly familiar to you. Your goal is to encounter monsters, weaken them in battle, and then capture them. Rather than using Pokeballs, you will use cards to “seal” each monster. Before you deploy a card, you will be given a percentage that explains how likely it is that your attempt to catch the monster will work. Bear in mind that to best enjoy the game, you need to be in a spot where you have internet connectivity. That being said, Haypi Monster is pretty fun, and any monster hunter fan needs to give it a try. However, the game did crash on me a couple of times during battles, which was REALLY annoying. Tired of gaming solo? There are plenty of opportunities for multiplayer combat! Team up with your friends or participate in the Ladder Tournament and compete with players from all over the world to see who reigns supreme. 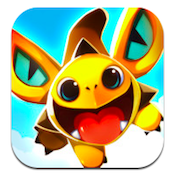 With six scenes, hundreds of levels, eight different monster alignments, and over a hundred monsters to capture, there is a ton of variety to relish in this epic monster game…despite some flaws. 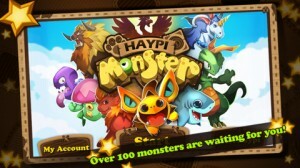 Haypi Monsteris compatible with iPhone, iPod touch, and iPad. Requires iOS 5.0 or later. This app is optimized for iPhone 5.